The food at Malak Marketplace is getting naughty this month. 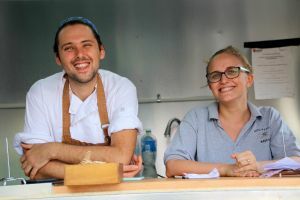 Martin Wildman and Kelly Ready from Needle In A Haystack are bringing the dirty burger craze to Darwin with a vegan edge for their new stall Nothin’ Like The ‘V’ Thing, Baby. Wildman says the idea has been brewing since being introduced to loaded burgers back home in the UK. “I was in uni when this whole Ameri-can dirty food trend started,” he says. The popularity of the Malak Marketplace has grown since its inception three years ago, and Needle In A Haystack has a solution to the hunt for a spot to eat. “We’ll have a little pop up restaurant there so people can come and reserve a table,” Wildman says. There are plenty of other new stalls – and all the favourites – when the market kicks off in the multicultural hub of Malak. Co-founder Lina Paselli says there’s a lot of love that goes into making each event such a special occasion. 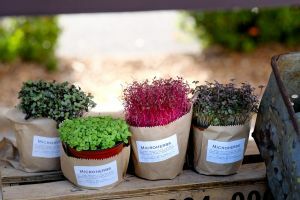 “I always feel an enormous amount of energy coming from the happy vibes of the farmers, food, health and arts stalls in our community,” she says. The farmers’ market also offers a very different kind of grocery shop-ping experience. “At the market you can build relationships with our farmers, make long term friendships and feel great about supporting local businesses,” Paselli says. Get in early to see the sun set and scoff down a delicious feed.